Plant this beauty in full sun for its best flowering and fruit display. Lavender-Pink flowers in summer followed by amethyst colored fruit continuing thru October. Cross pollination and berry production best with more than one. Excellent in a bird garden. Superb shrub valued for display of abundant clusters of long lasting violet berries along its branches in fall. A beautiful addition to Audubon gardens as a late season food source for many species of birds. New growth has bronze tinge. Small purplish pink flowers appear in summer amongst the large green leaves. Prune in late winter to early spring to encourage new growth. Deciduous. An award winning variety with the bluest foliage of all! Blush-Pink flowers produce a large crop of large, sweet, juicy berries on a compact, mounded shrub. Perfect for massing in the landscape or featuring in large containers. Self fertile, though planting another variety may yield a more prolific harvest. The 'climax' variety is prized for its abundant crops of large sized blueberries in late spring. Its earlier ripening period make it a popular choice for homeowners who want to extend their harvest time. Plant more than one for good pollination. This is a very popular variety due to an earlier crop than most other blueberry bushes. White flowers are followed by large, sweet berries. Nice edible landscape shrub producing an abundance of large fruit in July. Foliage turning fiery orange in the fall. So unique! This new pink blueberry provides year-round beauty and interest. Pinkish-white, bell-shaped blooms appear in spring. Summer brings pale green fruit that quickly turns deep pink for harvest. Autumn leaves are bright orange and red. Fruit is deliciously sweet and mild; nice firm texture. Self pollinator, but will produce more fruit by planting more than one. Flowers late in the spring, so rarely damaged by frost. Large, juicy berries ripen in June and July. Adapts well to hot, humid summers. Excellent as a landscape shrub. Vigorous grower makes this blueberry bush an excellent edible shrub border. Although not necessary, planting more than one variety will bring you an abundance of blueberries and cross pollination. 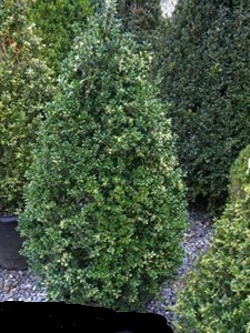 'Newport Blue' is a nice looking boxwood with its blue-green foliage and pyramidal form that only needs lite seasonal shearing to keep its shape. A perfect choice for small spaces, rock gardens, dwarf gardens or containers. A cold resistant boxwood that holds its green color well in winter. A superior low hedge both sheared and informal. Excellent foundation plant or as background for perennials. Evergreen.